Catching a fish with a fly that you've tied can bring extra satisfaction to the experience. However, the right tools and materials are needed. Fly tying and football season go together like peanut butter and jelly. For me and many fly tyers in the valley, not much is better than setting up a vise in front of a TV screen with a football game on in the background. It’s a great way to fill your fly box while drinking a beer and keeping up with your football team or fantasy points. After learning all of the necessary knots, how to cast your rod and hopefully how to hook, fight and land a fish, the next progression in your evolution as an angler is to tie your own flies. There’s a very special and rewarding feeling when you catch a fish on a fly you tied yourself. As with casting, tying is an activity that gets better the more you do it. Starting to learn how to tie can be a frustrating endeavor if you don’t have the proper guidance. It’s ideal to have a friend show you the ropes before trying to go off tackling the basics on your own. If you have to learn on your own, the internet is your best friend. Doing a simple Google search on fly-fishing, you will find hundreds of links and videos. The great thing about the videos is that you are able to pause and rewind to see crucial stages of a particular fly. As far as getting started on the tools you’ll need to tie flies there are a couple of different routes a beginner can take. Many companies offer beginner kits that will include the necessary tools to get started. Many of these kits give you the very basics and are an economical way to get into the hobby, however. If you really get into tying, you will end up replacing the majority of these tools found in the kit. The other route to take when getting set up with the tools is piecing together the necessary items one by one. Getting a good vise to begin will save you the frustrations associated with a cheap vise, for example, hooks slipping or not figuring out how to set up the darn thing. A good pair of tying scissors is going to be an essential tool that will be hands down better than what you’d find in most kits. Bobbins (the tool that holds and dispenses the thread) are pretty standard throughout the industry and are a must have tool for tying. Bobkin is a helpful tool for apply super glue or head cement to a finished fly. Lastly a whip finish tool is used to tie the finishing knot to your fly. With these five tools, you should be able to tie practically any fly out there, however you will find that there are an endless supply of new tools that will help with different techniques in tying. When it comes to the materials to tie flies, the options are endless. I started collecting my materials based on the flies I was learning to tie, however I’ll list some of the “must have” materials and their use. The two most obvious are going to be hooks and thread. Black, white and olive are the three thread colors every tyer should have at their station. Wire is another important material that creates ribbing or segments in nymphs and midges. It’s also used to create bodies in flies like the copper John. Chenille is another great material to have at your station. It is basically a pipe cleaner without the metal wire in it and is used for creating bodies in larger streamers. It comes in a wide variety of colors and sizes for different styles of flies. Natural materials are a very important part of fly tying. Deer hair is used to create wings in some flies and when spun it can create bodies and heads in other flies. Elk hair is great material for dry flies due to its hollow core, allowing it to float naturally. Peacock feathers are great because they have an iridescent quality to them that create extremely buggy, fishy flies. Pheasant tails also are a staple material used to create tails and bodies in many different flies. Dubbing is a material that has tons of uses in tying and come in a lot of different blends and origins. Hare’s ear and opossum are two of the most popular natural dubbing used. Antron and ice dubbing are synthetic blends that incorporate flashy materials to attract fish. There are also dubbing blends that mix natural and synthetics to create a hybrid material. Hackle are the feathers from domestic hens or rooster chickens and come in a wide variety of dyed or natural colors as well as sizes. Hackle is used to represent tails, legs, gills and wings, and creates animation, silhouette and special effects in flies. It’s wrapped around the hook to creates these different effects. 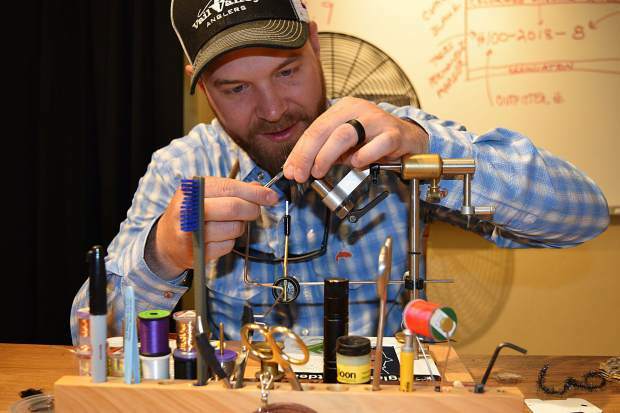 I could write an entire article or two about all the different materials used in fly tying. The items I listed above are a great place to start. I would suggest picking three to four flies you want to tie and collect the material for those flies. After tying a few dozen of those flies, pick a couple more to tie and really start building your collection of materials. Before you know it, you’ll have a large collection of materials to create flies. Fly tying is a relaxing and creative hobby that can elevate the pleasures of fly-fishing. It’s an incredible feeling to go from a bare hook to a finished fly. I always take great pride when I look into my fly box and know that I tied those flies myself. Tying will make you much more knowledgeable about fly selection and the general entomology that is present in our streams and rivers. We offer beginner and advanced fly tying classes at Vail Valley Anglers throughout the cold season taught by myself in our learning center. Call the shop or check out our website for more information. Get those creative juices flowing and tie on.